Hello! Hope your having a great day! It is so gorgeous here and finally hot! Yesterday we went and spent the afternoon with a great friend and enjoyed swimming in her amazing backyard pool! Today I took the kids to a splash park, starting summer off right! I made photo blocks! I emailed Ariel's music teacher's husband and asked for him to send me a bunch of photos, emailed her teacher's daughter and DIL asked for photos, and emailed the other teacher myself and asked for photos. Of course when I actually thought of the best way to take a photo it's blurry! The teacher's loved them! Perfect for there desk at school or even at home! I emailed and asked for some baby photos and made this! I stamped the baby's name and birth details onto a piece of pp with staz on ink! She loved it! It's great decor for the baby's nursery! Now I'll share how I made them. Most craft stores sell wooden blocks the same size as this. When I went to get one I was a bit surprised by the price and on the spot came up with the idea to hit a hardware store instead! I bought a fence post and had them cut them into squares for me! Usually they cut 3 cuts for free but since I had a car (couldn't fit the post in it) and it was slow they cut me much more! 3. Because you are using real wood you have to use a wood stain on it before painting it your desired color. Yes this is an extra cost but if you plan to make many of these blocks for birthday's or Christmas it pays off! A friend had grey wood stain and let me use it so that worked out well! Paint and let dry. I painted mine in the basement. 4. Sand any drips or rough paint spots. Now paint your desired color. I used acrylic paint. For the pink I had to do two coats, but for the black I only did one. Let dry. 5. Print out your pictures and crop to 3.25 (if your block is 3.5) use photos taken at a distance so that your not cutting anyone off! 6. 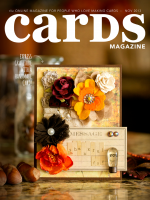 Apply Mod Podge to all of square and apply photo, put a thin layer of mod podge all over the photo. I use a brush and only brush it in one direction. Let dry add another layer. Let dry. 7. In the garage or a well ventilated area spray with a Clear Finishing Coat I used Kyron Crystal Clear Acrylic Coating! Let dry! And your done! I hope that explains it well! I enjoyed making this! And I plan to make more! Hello! 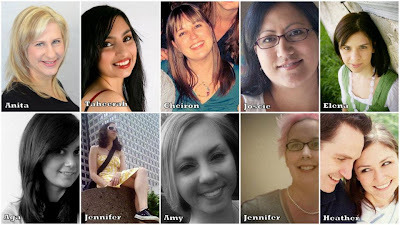 I want to start off this post by congratulting the Gallery Idol winner Joscelyn Cutchens! What an amazing card she made with the polariod camera! Who can compete with a light? So happy for her! 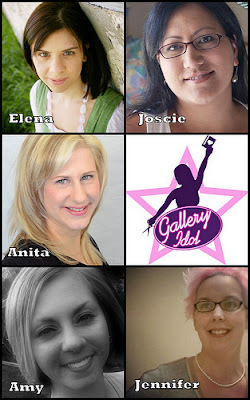 I want to share that even being part of the 20 for Gallery Idol is something I didn't think I would be. To have made it all the way to the Top 5 is a huge honor and something I am proud of! Really proud of! I feel that I worked hard and did make great cards for this so I have no regrets. I am beyond thankful and overwhelmed with all your love and support.You have rallied behind me and encouraged me to do my best! You have been amazing to me! You've made me feel like the most talented crafty girl in the world! And with that I am a winner! :> Big thank yous! To my fellow 20's I have absolutely loved getting to know all of you! Our facebook group has made this even better and less bite my nails and a bag of stress! It was fun to chat about everything and encourage each other! 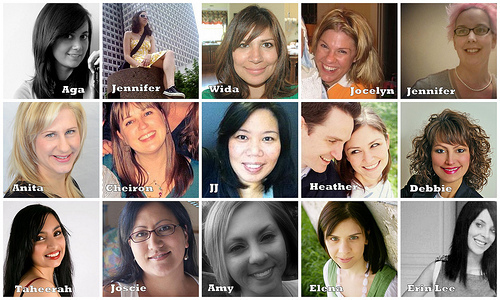 You are all amazing women who are so talented! I count myself blessed to be included with you! I hope we all stay in touch and friends! I am absolutely delighted and excited to be here today sharing with you my card for Gallery Idol Round 5! I still can't believe that I made it to the Top 5! Thank you so much for your votes and encouragement! The scratch off was so fun to make! I made the confetti with a 3 whole punch again! For the shaker I sewed a thin acetate onto the kraft card, I actually cut a clear envelope and used that! I sewed three sides and than added the confetti right before sewing it shut, I was worried I would sew confetti! For the die cut I stamped the ice cream cone coloring it with markers first and than colored it in with pencils. Stamped the sentiment over top and than made it a scratch off! For the scratch off I used 2 parts paint and 1 part dishsoap! I actually made a quick video sharing how I did it! Please ignore my scratchy voice the only good time to video is when the kids are in bed! And I've been having vocal problems again especially at night! 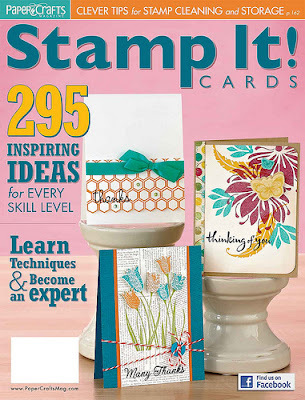 Scratch Off Tutorial from Anita Recksiedler on Vimeo. I hope that my video has inspired you to try out the scratch off technique! :> I also hope that my card has earned your vote ans that you take the time to vote for me! Thank you! I made it to the Top 5 of Paper Crafts Gallery Idol! :> ACK Someone pinch me because I can't believe it! I was so nervous last night! And this morning Chad was amazing and checked for me, I am so thankful for that! I feel so blessed to be here. 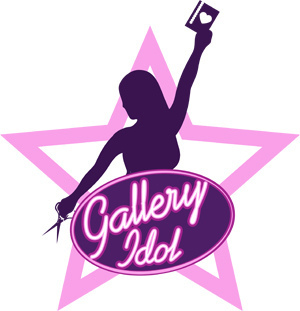 A year ago I remember voting for Gallery Idol and seriously thinking to myself how talented everyone was, amazed by what they came up with and never thought I would be there! Even this year when I entered I forgot the date they were announcing the Top 20 (well I wasn't going to be one.....) and than there I was! And now to be Top 5! WOW OH WOW! As you can tell I am excited! I love the challenge that is ahead of me, I am working on my card and can't wait to finish it. I was supposed to go the lake for a girls day with friends tomorrow but have decided to stay home. Not only because I need to work on my card, but because so much going on and it's best for my family. Hello! Hope your having a super day! :> Today is the first day of summer and summer is my favorite season so I am quite happy, now if only the weather was actually summery and hot and nice instead of dreary, cool and rainy! Well I am off to take Carter for a power walk before it rains! 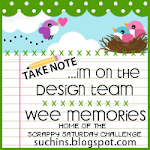 I wanted to share some exciting news, I am very excited to be part of the first design team for Scrapbooking Cafe Online. Scrapbooking Cafe Online is a Canadian (like me!) 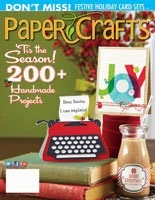 online store with great prices, there motto is Making Crafting Affordable! :> They have a blog where I will be sharing on Thursdays you can see it here. I embossed the newspaper tulips by Hero Arts in white on the paper, used a bunch of papers for this and tied some bright yellow twine by the twinery, LOVE there twine! Hello! Hope your having a terrific day! :> I am so excited to be here with my entry for Gallery Idol Round 3! I love how the papers work so well for both a feminine and masculine card! I absolutely love the blues, browns and the pop of yellow! I used my favorite technique heat embossing for both! For both cards I used paper strips but with different designs and really like how it turned out! I hope I've explained both cards well let me know if you have any questions! Thank you for visiting today!!!!! Hello! Hope your having a terrific Saturday! It's been a bit of a day of running around with the kids but now I finally finding myself with some time to sit down and craft a bit and it's a good thing because I made it to the Top 15 for Gallery Idol! Bring to a boil (on med heat) for 1 minute brown sugar, corn syrup, butter and cocoa. Let boil for 1 minute. (I usually melt on low and than turn to med to boil) Take off element and add vanilla. Add puffed wheat and mix until all is coated. Press into buttered 9 by 12 dish (or smaller if you like) Cool in fridge till it sets! Ariel's Piano Recital 2012, originally uploaded by AnitaRex. Well Gallery Idol voting for the top 15 has ended today and tomorrow I find out if I made the Top 15 or not. 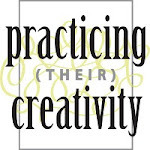 I am nervous and jittery about it but I am also the mom to two busy kids and well that helps! :> I feel that I did my best and that's all you can really do right? Yesterday Carter and I were baking sitting in the grass and he get's all excited and says "Mommy I saw a bunny over there!" He did? How did I miss it? Than he says "His name is John!" What a name for a bunny right? He said it so matter of fact too! Before bed I always find Ariel telling me all sorts of stuff, like "Tomorrow morning Ella and I are going to race! People cheer for you!" Me- "Oh really who?" Ariel- "Oh you know and lists off a few girls names and Reid and Jacob" Than we ask her who is the 5 kids you said you want in your class next year? (the school asks each kid this) Ariel "Katya, Ella, Paige and Reid and Jacob" Both boys have said they want to marry her! :> I don't think she has decided yet! And one last one, on Friday was soccer pictures and I was wetting Carter's hair and was going to add some gel. Me- I am going to make your hair curly! Carter trying to run away- No I want to be Carter! He gets away and starts drying in on a towel! LOL :>And here's his photo, he looks so cute! And that's it for me! See you soon! Hello! 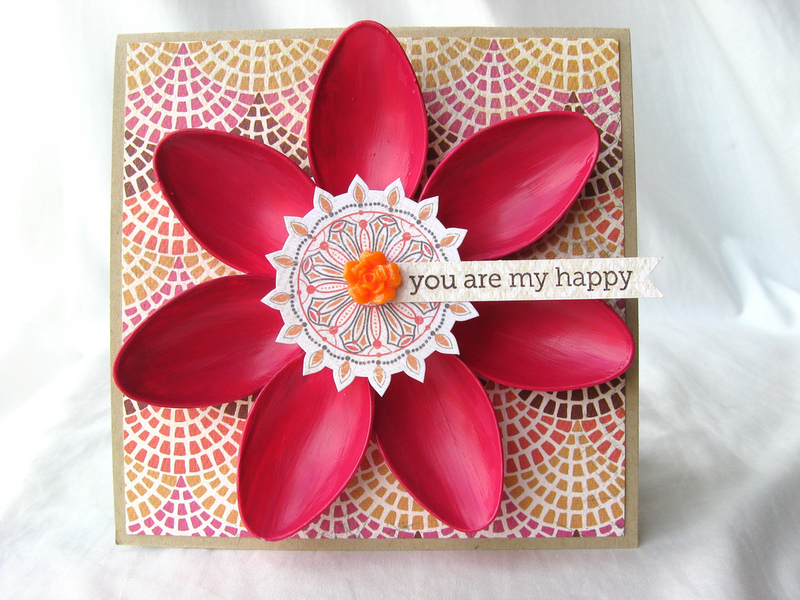 I am so excited to be here today with my card for Paper Crafts Gallery Idol round Two! I am still in awe to be part of this competition! The challenge was Color Your World! Right away as a mom to young kids a Rainbow came to mind! I thought and thought and thought and the idea of using confetti came to me! 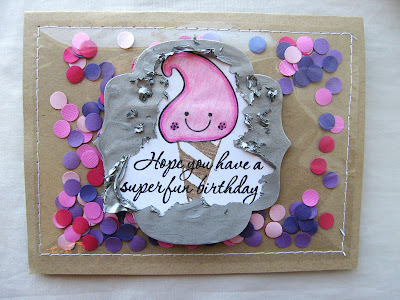 I've seen and read that confetti is a huge trend right now and thought it would be so fun to use that for my card! I thought it would be something different too! And that is how I came up with my card! I used a school supply, a three whole punch to make my confetti! I simply punched over and over Bazzill cardstock and made piles! Than I made a small pool of glue from my Tombow glue and used a q-tip to add the glue to the back of each confetti! 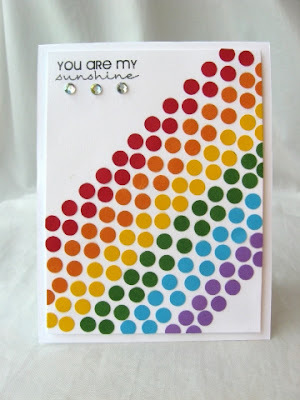 I stamped the sentiment from Papertrey Ink first, I love this sentiment I really think it pairs well with a rainbow! I than worked from the purple and up placing the confetti where I thought it should go first than gluing them each down! Added three rhinestones and adhered to the white card with dimensional adhesive! I really hope that you like my card! I really loved and enjoyed making it!!!!! I would love it if you voted for me! Please click the box to vote! I truly think each and every of the 20 cards are amazing! I am so honored to be part of this with such talented ladies! This weekend I've been a bit stressed and nervous but I told myself all that I can do is try my best and I think I have. I hope that you love my card as much as I do and take the time to cast your vote for me! I would simply love it to make it to the Top 15!